GMO food labels: Would label laws in Vermont, Maine, Connecticut increase food costs? Calculating the hidden costs of genetically modified food labels. 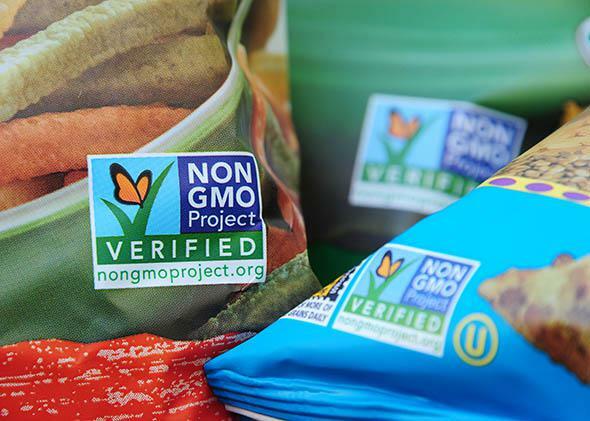 The voluntary “non-GMO” label, started in 2008, inadvertently sows confusion. The impassioned quest to label foods made with genetically modified organisms is heading for the states. “Don’t think that it’s not coming to you,” warned Hawaii Attorney General David Louie at a meeting of state attorneys general. They certainly understood. In 2014 alone, 25 states have proposed 67 pieces of legislation related to GMO labeling. After near misses in California and Washington, advocates recently ushered a labeling initiative through Vermont’s more receptive legislature. Maine and Connecticut have also approved labeling laws, although they are contingent on further regional support. Whether the labeling debate continues to play out on a state-by-state basis, or the federal government eventually intervenes, chances are good that we’re looking into a future food supply dotted with mandatory GMO labels. More than 90 percent of Americans think this is a good idea. As matters now stand, the voluntary “non-GMO” label, started in 2008, inadvertently sows confusion. Not every conventional food made with non-GMO ingredients uses the non-GMO label (a company may want to avoid the testing and regulatory costs). As a result, it’s impossible to know if the can of soup you want to buy—specifically, a can lacking an organic or non-GMO label—contains GMOs or not. Furthermore, non-GMO labels have been placed on products such as orange juice, suggesting that there are genetically modified oranges on the market when, in fact, there aren’t. None of this seems quite right. To a meaningful extent, a GMO label would bring some clarity to the situation. Labeling supporters point to a study commissioned by the Alliance for Natural Health, a U.K.-based organization dedicated to “promoting sustainable health and freedom of choice in healthcare through good science and good law.” This report claims “consumers will likely see no increases in prices.” Reflecting this polarization, a host of additional studies estimate that food costs could rise anywhere from a couple of dollars per person to 10 percent of a family’s food bill. This disparity hinges less on sloppy science or ideological bias than a basic disagreement over how food suppliers and consumers would react to a freshly minted GMO label. One side—the no cost/low cost advocates—equates a labeling mandate with little more than the paper and ink required to manufacture the label. The idea here is that food suppliers and consumers wouldn’t necessarily shift their purchasing choices in the face of a GMO designation. Mother Jones’ Tom Philpott gave a nod to this assumption when he asked, “Ever seen the words ‘new and improved’ on some boxed delicacy?” His implication was that the consumer’s gaze glosses over new labels all the time without leading to a radical shift in purchasing behavior. Why would it be any different with a GMO label? Realistically speaking, most consumers faced with a GMO label will neither automatically bivouac to the organic (or non-GMO) aisle nor react with complete nonchalance. It seems safe to split the difference and assume that a mandatory GMO label would at least create a modest demand for non-GMO corn, soy, canola, and sugar beets. Based on this assumption, we can begin to better assess what exactly is at stake when it comes to prognosticating the cost of a GMO label. Understanding the economic threat of segregation requires understanding the ubiquity of GMOs in our food supply. Eighty-five percent of U.S. corn, 95 percent of U.S. sugar beets and canola, and 91 percent of U.S. soy are genetically modified. Up to 75 percent of the processed foods on the market contain genetically modified ingredients. A GMO label—again, assuming at least some change in consumer choice—means that food producers would have to cleave the food system’s supply chain to segregate and audit GMO and non-GMO ingredients. This would require them to prevent cross-pollination between GMO and non-GMO crops, store GMO and non-GMO ingredients in different locations, establish exclusive cleaning and transportation systems for both commodities, and hire contractors to audit storage facilities, processing plants, and final food products. Surveying the potential compliance expenses based on a failed 2002 Oregon labeling initiative (Prop. 27), the Washington State report estimated that annual costs today would range from $150 million to $920 million. The administrative expenses of auditing alone could reach $1 million. And as for the legal expenses that would arise from suits over contamination: Let’s just say the vultures are already circling. It’s certainly possible that food will be reorganized into three general tiers—GMO, non-GMO, and organic—with non-GMO food moving toward the more expensive organic option while GMOs, which will be seen as less desirable, drop in price. However it happens, a cost-free label is a happy thought. But until the label becomes the law, and until consumers are set free to cast their votes in the aisles of the marketplace, we’ll have little more to go on than tea leaves. And until they are genetically modified to be more accurate, I’d prepare to pay more for food.